Aikido (the way of spirit harmony) develops the power of the mind and body working in concert and offers a constructive way for children, teens, and adults to use their energy more effectively. At Triangle Aikido, we provide training in a safe and supportive atmosphere that nurtures the listener and leader in each child. Our Family Classes teach kids and parents to resolve conflict without violence while building body awareness and coordination, teaching respect and discipline, fostering sensitivity and self-confidence, and having fun. Aikido is not about teaching children how to fight. We teach children how NOT to fight. Parents are welcome and encouraged to participate with their children. New students are always welcome to watch or participate in a class before joining. Feel free to stop by the dojo any Saturday morning to check out a class or to jump right in! 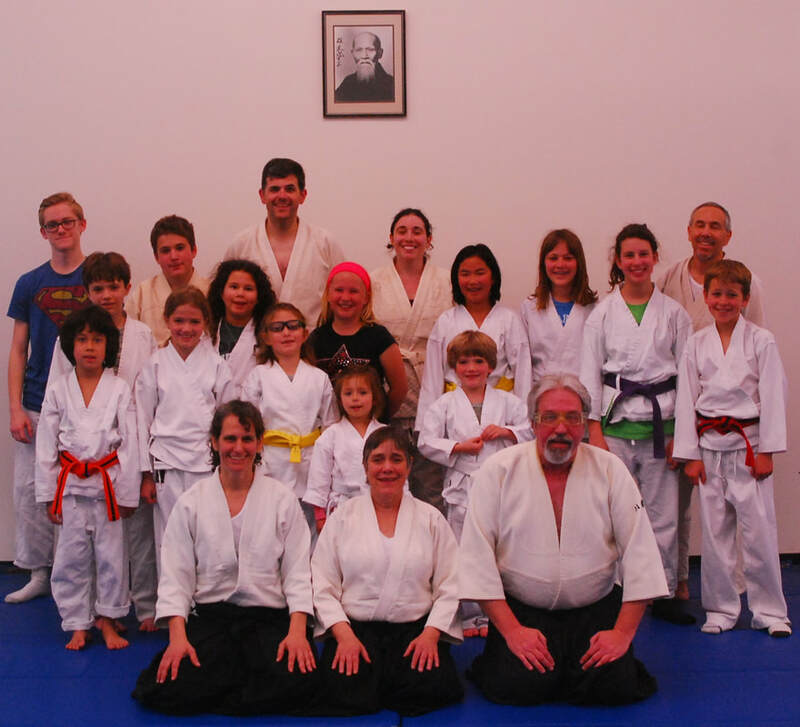 Lisa Smith-Rice (2nd degree black belt) is the primary instructor of Triangle Aikido's Family Class. Lisa has more than 20 years of experience teaching children’s movement classes and is a certified assistant instructor in the Aikido Association of America. "Your heart is full of fertile seeds, waiting to sprout." Family class is held Saturday mornings from 11:30 AM to 12:30 PM. Fees are $70 for six classes using a punch-card payment system, so you only pay for classes your child attends. Uniforms are available for purchase at the dojo but are not required. Aikido is a non-competitive martial art. We have no tournaments or meets. Occasionally we collaborate with nearby dojo to have seminars with other young Aikido practitioners. A nominal fee is usually charged and participation is always optional. Triangle Aikido has no contracts or testing fees for children. Family class holds two non-competitive demonstrations each year for students to display their progress and accomplishments. After each demonstration, participants advance in rank and receive a new belt. As children age out of the Family Class, they are welcome to join the adult classes immediately. Please stop by the dojo any Saturday morning at 11:30 AM to watch or participate. Students are welcome to join our class at any time. The first class is free!